From the series voted 2010's Kitchen Knife of the Year by Blade Magazine, the Shun Premier 8 Inch Chef's Knife applies the philosophy of Germany's most popular TV Chef, Tim Malzer, to the best in Japanese cutlery. The Premier TM line from KAI Shun Cutlery brings the hammered look of a hand-forged knife to modern Damascus steel. 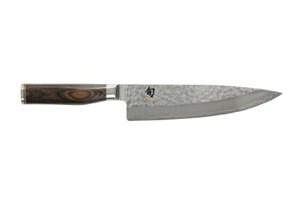 The most striking feature of the Premier Chef's Knife is the blade's hand-hammered tsuchime finish. Peened with a random pattern, the dimpled surface decreases friction compared to a smooth polished surface. Layers of damask high carbon stainless steel increase the low-friction effect. This 32-layer construction surrounds a central core of long-lasting VG-10 steel hardened to between Rockwell 60 to 62. This beautiful chef's knife improves handle and blade in a product that was already one of the best available. A new handle shape makes the knife a better fit for Western grips. Layered Pakkawood with the look of black walnut gives the grip a more natural look, but the resin-injected wood exceeds natural materials in durability. Pakkawood resists heat and moisture and needs nothing more than wiping down to maintain its high polish. Made from genuine hardwood, Pakkawood improves the quality of the knife but keeps the unique appearance of real wood. A narrow front bolster gives the knife extra strength without interfering with the knife's slicing action, and a stainless steel end cap displays the Shun logo. See the 8-Inch Chef's Knife from R.H. Forschner for an excellent chef's knife at a budget price.